Step by Step, slowly we turned! Photo Trip Report to Niagara Falls & MarineLand! Should bert post lots of pics of the falls in his trip report? Re: Step by Step, slowly we turned! at the 1962 Seattle World's Fair! And to this date, it's the only one I've ever ridden! Glad to read your trip went so well for you, Bert! At the back, there's the go-kart track. 1962 Worlds Fair Archives. we really did have a wonderful time, even tho we ended up skipping a couple of things that (I think) would have been fun. ytterbiumanalyst wrote: Nice! 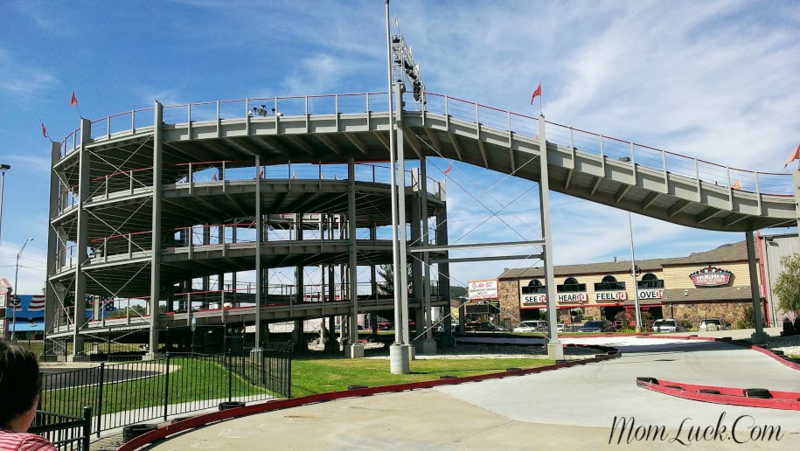 We've got a go kart track just like that in Branson, and there isn't a person warning you to slow down. The airtime is real. EDIT: Not my photo, but gives you an idea. that is cool. . . not as many "bumps" as the Niagara one has, but if they aren't slowing you down at the top, I'll bet you do get some really great airtime! bert425 wrote: There was also a really neat go-cart track, with gas powered go-karts that we had seen the corner of from our hotel, but hadn’t realized it was “Mario-Super-Kart” type, with the winding ramps (this apparently had opened recently, as it looked brand new and was doing brisk business). We stopped and watched it for a bit, and did a lot of looking at the attractions, but didn’t actually ride/do anything. . we just sight-seed. There’s a Pink Panther themed ‘swinging balloon” ride on top of a building over here too. . with apparently a view of the falls, but it didn’t seem to be open. (I’d seen some past reports that there used to be a WWF themed ARM Drop Tower here too.. but didn’t see any indication it ever existed now). I actually don't know how good of a view that Pink Panther balloon ride has since it's blocked by the taller buildings next door. I did want to try it, but it has extremely limited hours. As for the old WWE drop tower, Pile Driver, I rode it once back in 2010 or 2011. I wish it was an ARM tower. It was a Zamperla Z Force. The ascent wasn't all that forceful, but it did have a strong pop of air at the top and I got a double ride. I think it would have been better if it held you at the top if you could enjoy the view longer, but it was nice for what it was. I think a brewery is now in its place. Glad to see that go kart track open! I love these crazy courses. Fun Spot has a similar one with a huge drop followed by a banked (yes banked) turn and another drop immediately after. I read through this entire thing on the plane the other day and it's wonderfully written. Glad you guys had fun! Always a good read as a lot of things that you do are things I'd never do, so it's fun to see a different perspective. Thanks for the write up! coasterbill wrote: I read through this entire thing on the plane the other day and it's wonderfully written. Glad you guys had fun! LOL. . yeah, I can get bogged down in details. glad you enjoyed, we really did have a great time. And for the most part, no fighting! (only minor squabbles). PKI Jizzman wrote: Always a good read as a lot of things that you do are things I'd never do, so it's fun to see a different perspective. Thanks for the write up! we LOVE the tacky touristy things. . which is why I was a little disappointed we didn't partake in any of the Clifton Hill offerings (tho not much, we were tired). But I did enjoy walking thru and looking at stuff. I'm a planner for a living, so I always try to cram in a LOT when we go on trips. So glad that you guys had a great time, along with great weather...which is usually iffy around here during this time of year! Philrad71 wrote: So glad that you guys had a great time, along with great weather...which is usually iffy around here during this time of year! thanks, yeah, we lucked out and no rain until leaving! not even any overcast until leaving! been thinking about y'all. . how is Michael doing?